Samuel Colt, the son of a factory owner, was born in Hartford, Connecticut, on 19th July, 1814. After leaving school, Colt worked at his father's textile mill. He was fascinated with machinery and spent his spare time disassembling and reassembling his father's guns. In 1829 Colt became a sailor. It is claimed that it was while Colt was a sea that he got the idea of designing a pistol with a revolving cylinder containing several bullets which could be fired through a single barrel. On his return to the United States he continued to work on his invention and in 1835 he patented his five-shot revolver. It was a revolutionary design as it transformed a firearm into a multiple-shot device. In 1836 Colt established his Patent Arms Manufacturing company in Paterson, New Jersey. As well as his five-shot revolvers, he produced rifles and shotguns. John Coffee Haysof the Texas Rangers purchased colt revolvers for his men. The Comancheswere used to fighting against men armed with single-shot guns and suffered heavy casualties at Plum Creek (1840) and Enchanted Rock (1841). Despite this success sales were generally slow and in 1842 he was forced to close down his factory. Over the next few years he worked on a device that could set off an underwater explosive by remote control. Later he became involved in telegraph technology and developed the first underwater telegraph cable. In 1847 Colt designed a six-shot Walker revolver. Soon afterwards the United States government ordered 1,000 revolvers for use in the Mexican War. Colt was now in a position to establish a new factory in Hartford, Connecticut. By 1855 Colt had the largest private arms manufacturing facility in the world. He produced a wide variety of different revolvers. His Navy Colt was especially popular with gunfighters like Wild Bill Hickok. During the American Civil War Colt's factory sold 300,000 revolvers and a 100,000 rifles. These guns were purchased by both sides. 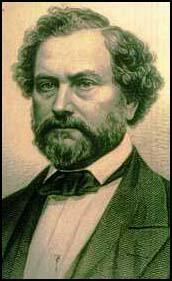 Samuel Colt died on 14th January, 1862. His wife, Elizabeth Colt, took over the running of the company that now employed 1,500 workers.